To insure that I update on a regular basis (is kind of scatter-brained :p), I'll be posting a minimum of two posts a week, with updates happening every Monday and Friday. That being said, tonight's post will still happen....just getting a few things laid out :)! So, in the past week I've been working on a few different projects (including the one that will be the major content of the next blog post!) and figure I might as well lest them off. I'll try to keep them listed to the side panel and labelled for easy browsing later! The one of the projects consist of studys of old paintings in oils (on clear gesso'd linen) and the other some small paints (based on building photos from paris) on masonite (hardboard is the common name) and Ampersand Hardbord (archival hardboard). The other projects will be listed, and I hope to have some pictures and such posted by friday evening. Starting today I will be posting my numerous experiments and trials (complete with results and reviews of materials) of projects I'm working on! In the last six months I've used so many different materials, and have learned so much about different mediums, that I really need to put down what I've come across! For the first time in about 5 years, I've been working on multiple on going projects (not school related), and in different mediums. Each has its pros and cons, but with research, and some trial and error (and some fun along the way), I've discovered some pretty cool stuff. I'm really exited to start sharing what I've come across, and hope that it might help someone in there own artist endeavors! For the first project, I decided to do some small water-mixable oils on watercolour paper. This was a practice round. I hadn't worked with oils in some time, and really wanted to paint again. After much reading into oils a little more and reading more about the existing materials I already had already owned Demco Linseed oil and both Winsor Newton Artisan oils (water soluble) and Winsor Newton Alkyd oils (fast drying and soy-based). The last time I used Linseed oil in my apartment, it smelt for days, not to mention I got a pretty bad headache from the smell. At least I thought it was the linseed oil. After some reading, I found that the alkyd oils where actually the thing that caused it. Water-mixable seemed the way to go. Water-mixable oils are modified so that the paint molecules can stick to water, rather then repel it as regular oils do. They look, and move the same as regular oils , with solvent-less clean up. I hate solvents with a passion and always try to go the least toxic/flammable route. I had used the Artisan oils before, and found the colours pretty dull unless you used oil. A teacher told me once that you can mix water-mixable oil paints with your regular oil paints, as well as regular linseed oil. After reading more into linseed oil, I was hesitant. Painting rags with linseed oil (both regular oil and the water-mixable linseed oil ) on them, if not properly deposed of can spontaneously combust. I had used it before, and DIDN'T KNOW THIS! So, I decided to go with walnut oil (as recommended by a health conscious co-worker) instead. Walnut oil is a vegetable oil that can be used instead of linseed oil, and even yellows less with time then its flammable counterpart. It can also be used to clean your brushes! A plus = it smells delicious >Although, watch out! It goes rancid fast when opened unless you put it in the fridge. If id does go rancid, it can still be used...it just wont be pleasant. 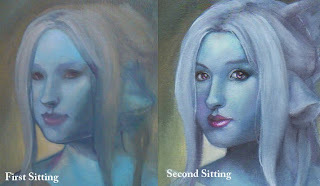 Since I did decide to go with water-mixable oils, I thought I should stick to water-mixable mediums for easy clean up. A customer from my work, recommended safflower oil. Its also less toxic and smelly then linseed oil, and closer to walnut. Its supposed to be better with lighter colours. After looking at the colours I had already in Artisan oils, I realized they were all pretty dark. Ok, so it was partly an excuse to try something new, but it was valid. I decided to go with COBRA water-mixable oils for magenta, cyan, Indian yellow, and burnt umber (later I also picked up some ivory black and titanium white). When something says artist quailty it usually means there is more pigment in the paint, and less filler. 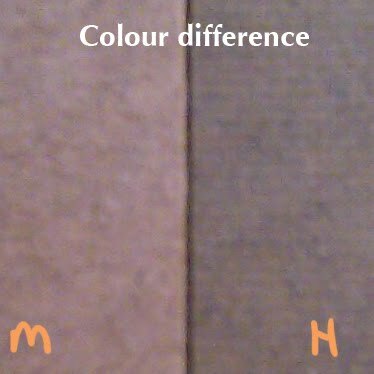 You can really see the difference when it comes to colour. Colours are duller in student quality paints, and much more vivid when it comes to artist quality. Being curious I decided to see how much so. 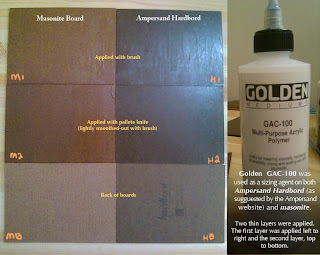 I decided to use both COBRA and ARTISAN paints by first just using water instead of oils. I like the result so far, but the non-COBRA colours are less vibrant!The brighter colours that really show through (magenta/cyan/Indian yellow) are COBRA, and the duller ones are the Artisan oils. The Titanium white would never go white enough when mixed with water. Haven't tried the COBRA Titanium white yet. That will be the third sitting I think. Artisan Colours: Cad yellow pale, French Ultramarine, Yellow ochre, Premanent Allizarin Crimson, Phathalo Green (Blue Shade), Titanium white. I did this painting on a piece of 300lb watercolour paper taped to a piece of Masonite. After taping the paper down with blue painters tape, I did a rough sketch of a face. Over this I did two layers of matte medium (in opposite directions to make sure it was even) to not only secure the drawing in place, but also to act as a ground between the paint and the paper. Gesso is typically used, but after watching an oil painting tutorial by illustrator Donato Giancola, I thought this would be a good way to still have the sketch to show through while working. He usually mounts his work on Masonite, and then proceeds to do about four layers over the drawing. He does this to protect it and act as a good ground to work on. This simple method blew my mind! It means you can do a tonal drawing, print it, mount it, and paint over it, without having to redraw the thing your going to paint. A less painful way then redrawing from a sketch or using the grid method! So far I like the result, but have yet to test the better white, black and water mixable safflower oil.